On 22-25/5/2008, and on 5-12/6/2008, trainer Brahim Talioua had a qualitative experience at the invitation of some organizations that organized open spaces on the occasion of the Family International Day. These spaces were organized in different places in Rabat-the Capital. These seminars included open discussions with the public concerning different issues related to the family, where there was a specific lobby to combat drugs addiction, another one concerning family and legal counseling, and one for the females' products. It was a suitable occasion for the organizations to introduce special services concerning family listening and orientation. 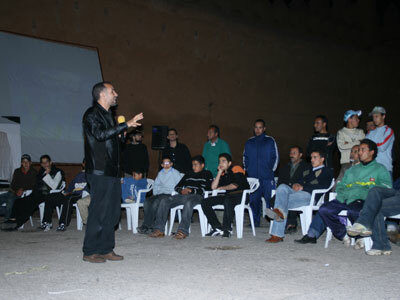 During these open activities, trainer Brahim Talioua had interactive discussions with the public. These activities were workshops tackling individual's life inside the family on a daily basis. During this workshop, the trainer listened to some of people's problems and commented on them. These seminars were distinctive for the immense interaction, handling family issues and allowing many social classes to express their opinions spontaneously. The trainer once, during a seminar, gave an example about a lady who was complaining about her husband that he was never intimate with her during three years of marriage. After telling the story, a 70-year-old man objected strongly. For him, man's job is to secure his family, provide living and settlement, so such things like intimacy is secondary. The trainer had hot discussions with a lot of the attendance, some agreed while others didn't. 1- It's a simple mass effective way of communication because it takes back to the time of the storyteller who is known in the Arab world and in Morocco in particular. 2- Using a smooth and simple language for all people regardless of their education. 3- The trainer must have skills for organizing the discussions in a respectful, disciplined atmosphere. He should be flexible to pass the unorganized issues (once an insane attended a seminar, wanting to interfere and give his opinion). The discussed issues must not be long. The focus should be on short, effective messages along that there should be educational games and puzzles that attract the attention of all.